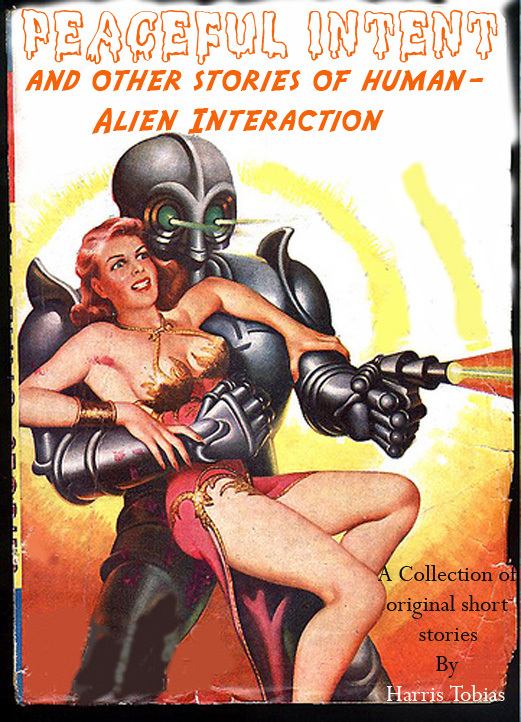 A collection of science fiction short stories describing the misunderstood and confusing results of two cultures trying to understand each other. When aliens and humans interact, the results are often either comedy or tragedy. In this terrific collection of 31 original and often hilarious stories, author Harris Tobias explores both possibilities. This is off kilter science fiction at its best. So strap yourself in and get ready for a fun ride through the cosmos. The Thorax were annoyed for a change. For such an advanced race they demonstrated an almost childish lack of patience for anything not Thorax. Large, dish shaped creatures, their tentacled arms emerged from their cup like base making them look like fountains to the Terran ambassador, Jacob Howe. But for their incessant buzzing, they would be quite beautiful ambassador Howe thought. It was anger and annoyance they were expressing in no uncertain terms. Their insect-like buzzing sounded like static. Tentacles flailing, the Thorax ambassador was appraising the council on the latest outrages perpetrated by the unruly Terrans. Ambassador Howe and the rest of the council had heard it all a million times before. Howe stifled a yawn as he waited his turn to speak. The Human/Thorax conflict had been simmering for aeons, sometimes like now with shouting, sometimes with shooting. There was little the Galactic Council could do. The dispute had become so tangled and contentious it seemed to the rest of the galaxy that it would never end. At least they weren�t shooting at one another at the moment. Each side liked to go through the pretense of being reasonable before they resumed killing each other. The two races hadn�t had diplomatic contact for ages having withdrawn their ambassadors and shut their embassies over some long forgotten insult or other. Of course there were pesky squabbles all over the galaxy. That was the point of the council after all. Take the Lomons and the K�aflips, they�ve been squabbling over the ownership of the galactic core for centuries. As if ownership of a massive black hole was something worth fighting for. And then there was the Glatts and L�ulluum. they were only kept from annihilating one another by a hugely expensive peace keeping operation. No one had any idea what that dispute was all about. At least the Terran/Thorax dispute was pretty clear cut�the Thorax were petty, mean, selfish and in the way. No amount of talking was going to change that. Even now fleets on both sides were being made ready for purely defensive actions.